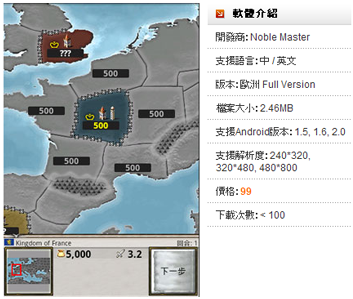 Age of Conquest has been released in the S Mart Store in Taiwan for Android devices. The game has been translated to Chinese by my friend Alex. I was going to post a direct link to the game in the store, unfortunately that is not possible as the site only uses HTTP POST to link pages. To find the game, click on the 3rd tab from the left and then select the bottommost item in the 2nd menu list on the left-hand side.